BACKTIME: Who Will Net LeBron? Remember the 2007 World Series? The Red Sox were about to sweep Colorado for their 2nd title in 4 years, but as Boston was just a few outs away from a championship, it was leaked that Alex Rodriguez was opting out of his Yankee contract. It was a power play by Super Agent Scott Boras (and some say A-Rod himself) to thrust his client's free agent status on to baseball's biggest forum and upstage it. Now the same is true of LeBron James. Except nobody has to concoct any publicity ploys, and the season has a full month plus an amateur draft for the LeBron situation to simmer on the stove. It is one of the most fascinating offseason developments of all time, except the season is still on! So how does one gauge the ebbs and flows of this moving target? It's simple, gamble on it. And more than that, you can buy or sell your position like a commodity as the rumor winds blow. Just like Intrade.com, the prediction market that was thrust into the national spotlight during the 2008 presidential election season: You buy a contract or a series of contracts and each is worth $100 if it proves out but zero if it doesn't. You can buy or sell, making a profit or cutting your losses along the way. You can see, Cleveland is a slight favorite to retain LeBron, followed closely by Chicago and the Knicks. We at Backtime think that his return to Cleveland is an impossibility. If he didn't win there last year or this year, he never will. Let's go make his fortune somewhere else under a greater spotlight in his quest to become the first billionaire athlete. The real darkhorse is New Jersey, which you can buy in at 13-1, but has incredible buy-low, sell-high possibilities. I mean maybe I got sold a bag of goods by new Nets owner Mikhail Prokhorov during Mike Francesa's sprawling, entertaining 50-minute interview today on WFAN/YES. 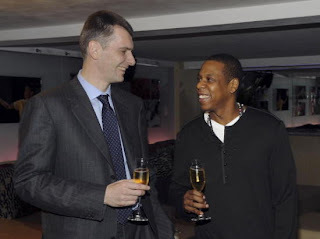 Prokhorov said the Nets (worst record in the NBA this year) would be a playoff team in one year, an NBA champion within 5 years, and with a dynasty to follow. He mentioned on many occasions during the interview "surprises" that would boost the profile and the quality of the floundering Nets franchise. The Nets will be moving to a brand-new venue in Brooklyn within a couple of years, and there may be a change in the team's name that coincides with that. Prokhorov is a 6-foot-7-inch, 45-year old self-made billionaire. His personal wealth is listed at 13.4 billion and Forbes ranks him as the 39th richest individual in the world. He's richer than Mark Cuban, and cooler than James Bond. LeBron may very well be listening to what this man has to say. Not to mention, LeBron's buddy Jay-Z is still a minority owner in the franchise, and also wants a seat at the billionaires' table. Now, who will coach the Nets is a mystery as well. But it doesn't quite capture America's imagination.